Pivot points used to be referred to as "traders numbers" because of the popularity of these points amongst floor traders. The theory behind them is that markets tend to have overlap from one period to another. On most days, the daily high or low is within the previous day's range, as with the previous week's extremes, and previous month's extremes. In this sense, pivot points are a counter trend indicator. However, many traders believe that once one point is violated, the next point will be tested, making a violation of these support and resistance levels a clue in trend following. Though we cannot vouch for the truth of this statement, the popularity of pivot points amongst floor traders tends to make these points worth watching. The popularity of these numbers can be seen on any day when the exchanges are cleaned-up. The trading floor is literally piled high with folded pieces of paper that contain pivot points calculated on them. The uses of pivot points varies greatly by trader. The most common function of the daily pivot is as a guide. If prices are trading above the pivot point, then the trend is considered up. Traders may wish to take short-term positions on a violation of the daily pivot to the upside with an initial upside objective of the 1st resistance level. If prices stall or slow at the first resistance level, then aggressive traders may wish to take profits. However, if the first Resistance level is violated to the upside, then the market should go on to test the second resistance level. If prices have violated the first resistance level, then this level should act as support on future pullbacks, as should the pivot point. The opposite is true for support levels. A violation of the daily pivot to the downside indicates that the daily trend is down, with a downside target being the first support level. If the market stalls, then traders may wish to take profits on short positions, or initiate long positions in anticipation of a retracement to the daily pivot. However, if the first support level is violated, the day is said to be a strongly down trending day, and as such should move down further to test the second support level. As with the resistance numbers, the support numbers, once violated, become resistance lines to trade with in the trend. Though originally used as a means for floor trading, longer-term traders can use pivot points for longer periods. 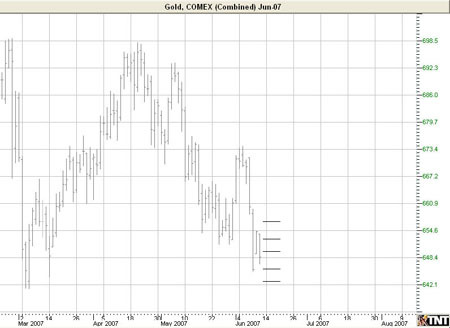 Try plotting the weekly pivot points on the daily chart and using it for shorter term positioning on the daily charts. Pivot points can also be calculated using the monthly pivot points on the daily chart, and used for longer-term positions. There are several methods used to determine the Pivot Point. We have included the three different formulas in Track 'n Trade 5.0. Restore Settings: TNT Default will change your settings back to the original software settings. My Default will change current settings to your personalized default settings. Apply To All Charts will apply your selected settings on all open charts. Save As My Default will save your current personal settings. Pivot Points: Check the boxes to view different support and resistance lines. Change the color, style, and thickness of the lines. Calculation: Select Traditional, Variation 1, or Variation 2. 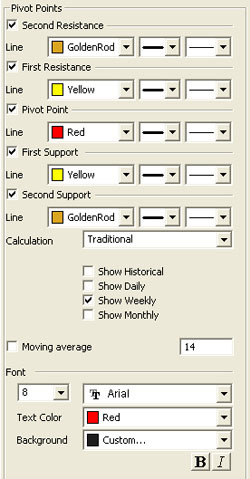 Display Settings: Check to display Historical, Daily, Weekly, or Monthly pivot points. Select if you would like to see the Moving average line and enter the number of price bars you would like to be used to calculate it. Font: Select the font, size, and color of the text. You can also choose to bold or italicize your text and change the background color.